Last edited by richie4eva1 on Sun Dec 11, 2016 2:20 pm, edited 1 time in total. Bad answer for box 23 ... for the FINAL ever time. Last edited by Mark on Sun Dec 11, 2016 2:21 pm, edited 4 times in total. As Tony Blair said at his final PMQs, "That is that, the end". Wave goodbye to the studio! Called it. It was also in Box 23 in the last taped game (Beverly & Tony's) as well. And I see Noel's final words were the standard "see you next time", hence there being no reference to this being the final studio game. Was praying for a decent end to the studio games and... well, at least he didn't end up with the dream finish and at least box 23 didn't have double. Could have been worse is all we can really say. I think the banker would probably have stuck at 5-box with the 1p still there. Let's hope the touring shows really do finish the show on a positive note. Though Roop could have done but what was stopping him was his wife being there. I very much doubt he would have gone for it though. The number of times I've said "Previous game" and "Bad answer to box 23 "... oh I've lost count. 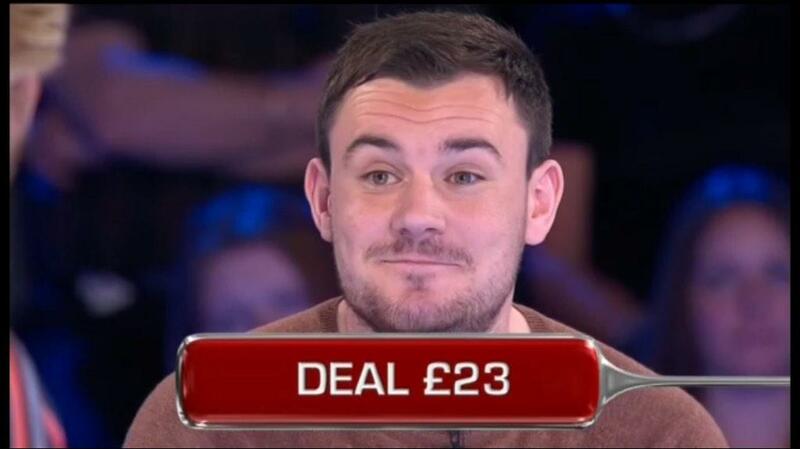 Unlucky result from a perfectly reasonable deal to end the studio shows. Hopefully he won't have too many regrets. I managed to catch much of this game in work, where I've seen most of the final games. It's probably the first time I've viewed the games as a casual viewer, rather than the hungry fanboy of 2006/7 and the stats obsessed stick-poker of 2012. Best way to watch it, with colleagues and myself hurling abuse at wingers who dare to open large values. Chuckle. No way would I have dealt at £26,000. Go big or go home, that's the way to do it. But, alas, we don't be doing it anymore.